It was a dark and stormy night on Recruiting Street. A young talent acquisition professional had just gotten done with a hard day’s work and was ready to watch a movie to relax. They had just pressed play when a loud crack of lightning startled them. The power went out, leaving them in complete darkness. And that’s when they heard it. They jumped up and found themselves in a cold sweat on the floor. The lights were still on and the source of the voice was nowhere to be seen. It was just another terrible recruiting nightmare. — 3 of 4 HR managers have caught lies on candidate resumes. — It takes an average of 29 days to fill an open position. — 30% of job seekers have left a job within the first 90 days of starting. 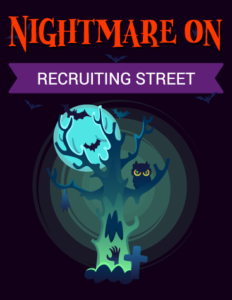 Check out the full infographic here to get more tips on how to survive any recruiting nightmare. What are some other things that keep recruiters up at night? Let us know in the comments!